March is definitely coming in like a lion. It's another snow day here with the added bonus of rain just to make it slushy. Hopefully, it will go out like a lamb. For now, let's look back at February. It wasn't a great month for challenge reads or any reads actually. First up is the 4th Canadian Reading Challenge. I managed to get one book read for that challenge Motorcycles & Sweetgrass which was a great read. I highly recommend it. That brings my total to 11. Just 2 more books and I will have completed the challenge for this year. I had more success with the Audio Book Challenge. I read 3 in total: The Dark Worlds of H.P. Lovecraft, The Prince of Mist and Married With Zombies. I completed the requirements for my challenge but since I like audiobooks, I'll keep going. Unfortunately, I haven't read anything for The Foodie Challenge, The Nordic Challenge or The Daphne du Maurier Challenge. I've been looking for a good cookbook but haven't found one that appeals to me lately. Do you have a recent favorite? I ran into a snag for The Daphne du Maurier Challenge review blog. The Linky tool no longer works. I'm glad I have all the review links for the participants up to January here on this blog in the Challenge Roundup posts. I'll work on getting them together. Unfortunately, if you left a link during February, I don't have it. Please leave a link in the comments to your review and I'll post it. I managed to find Sarah's (The Book Nook) link to her thoughts on The Loving Spirit, an older work of hers. Thanks Sarah. Only a couple of months left to the end of the challenge! Speaking of Daphne. There will be a 'new' book of her work published in May (in the UK). These are 5 short stories written in the 1920s, thought to be lost, and another 8 of her stories written in the 1950s. I can't wait to get my hands on it! I hope the book will be available in Canada too. I didn't do as well as I had hoped with challenges in February. Really must do better in March! 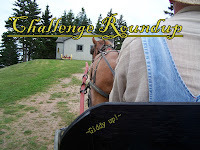 I updated my 2011 Challenges page this morning. Turns out I'm really only making headway on the E-Book Challenge! Definitely need to remedy that situation. Enjoy your challenges and your March undertakings! I actually did much better with my challenges in January and February than I thought I would. Hopefully you'll cross a few more books of your list next month.